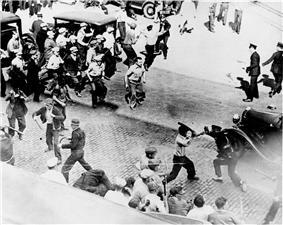 Violent confrontation between working class union members and law enforcement such as the one between teamsters and Minneapolis police above were commonly frowned upon by professional middle class. In the United States there has long been a conflict between the working class majority and the professional class. The conflict goes back to the workers revolution and age of unionized labor in the late nineteenth century. Since the 1870s and the rise of professionalism, the daily routine of American workers has been largely designed by professionals instead of foremen. Today, most American workers –many of whom earn middle-range incomes and work in white-collar occupations – are usually not resentful of the professionals, though a feeling of disconnect persists. Even nowadays there is a large visible discrepancy between professionals whose main job duties include visualizing and directing the day of other workers and those who carry out the orders. While the work of professionals and managers is usually largely self-directed and appeals to the interest of the individual, that of middle-range income white-collar and blue-collar workers is closely supervised and tends to greatly stray from the worker's actual interests. Yet another reason for resentment toward the professional middle class on the part of the working class stems from the embedded feelings of anti-intellectualism. When combined working class workers seem to often be under the impression that their better paid, professional managers are not actually "doing anything" as most of their duties are to conceptualize and outline their ideas. In the 1960s, tensions between classes flared up again. The student protestors, many of whom had deferments and were therefore exempt from fighting in the Vietnam War, were generally the youth of the professional middle class. Though the student protestors envisioned solidarity with the working class as a means of opposing "establishment" policies with regard to war, race, and other social issues, the student protestors' lack of support for the Vietnam War, as well as generalized antipathy toward youthful rebellion, alienated the working classes. In modern-day America, a common view among some members of the working class or less privileged members of the statistical middle class is that while the professional middle class is paid better, they are less directly involved in the production of goods and services than those of the working class. This difference in pay coupled with the impression that professionals and managers are less hands-on in their work often evokes an image of unearned privilege in the minds of working class persons. Conversely, the fact that working class persons generally work with their hands may lead those of the middle-class to assume that those of the working class are incapable of abstract, intellectual reasoning. One must also consider that most professionals tend to work in their fields of interest; thus work may not be as perceived as dreadful and menial by them. For working class persons, however, the contrary may be true. This difference in job satisfaction tends to be perceived by working class persons as further proof of unearned privileged among their professional managers, further adding to class tension. Additionally middle-class persons may lack direct experience in relating to working-class persons outside of a formal workplace environment. Examples of interactions between both classes other than the common worker/manager interaction include that of consultations with physicians or therapists. Author Barbara Ehrenreich suggests that these relationships will often lead to the unconscious assumption of class privilege on the part of middle-class individuals in their dealings with members of the working class. Overall working class Americans are most likely to encounter a professional middle class persons in a situation where the latter either directs or advises the former. Meaning that working class persons usually do not converse with professionals unless they are receiving instructions or being given advice. Likewise, members of the contemporary middle class are increasingly unlikely to interact with working-class persons outside of a supervisor/employee setting, and will rarely attempt to know or relate to working-class individuals as individuals.